This is a comparison of the broadcast band during the day (at top) vs at night (bottom). Many stations are required to lower their power and/or change their antenna directionality at night because the absorptive D region of the ionosphere disappears and allow lower frequency waves to propagate via a skywave. Some stations, called clear channels, are allowed to maintain their high power at night. Chicago happens to have quite a number of them-- you can see them at 670, 720, 780, 890 and 1000kHz. Local stations including the clear-channels are marked (minus 1690). At night, you can see a carrier at nearly every 10kHz, showing many of the AM stations listenable at night from across the US. WSCR 670 and WBBM 780 are unfortunately also using HD Radio. Local switching power supply noise appears as very impulsive (fast horizontal bands) at about 615, 925, 975, 1090, 1230, 1500, 1550 and 1850kHz. 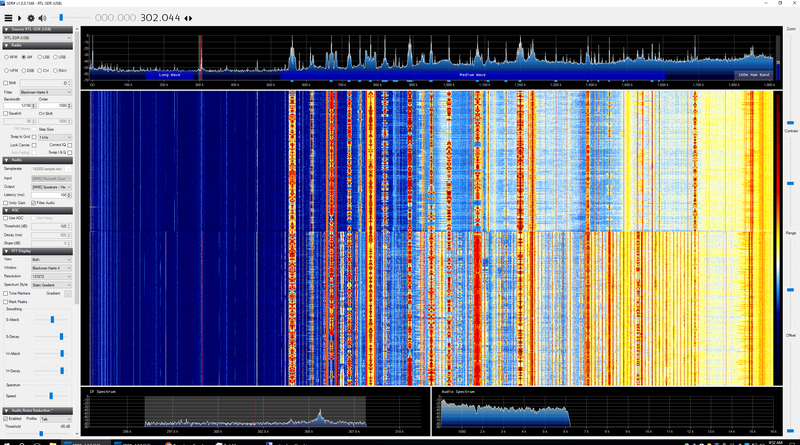 The fundamental for some of these appears to be at 306Khz. You can see in the IF this signal, as well as the much weaker DGPS signal at 304kHz from Mequon,WI. This was taken with a simple indoor dipole of 42ft length (with some turns in it) and a RTL-SDR.com v 1.3 dongle with HF direct sampling (Q-branch) and AGC turned on. The nanosat CUTE, or rather the CUTE-1.7 + APD II, sends out a beacon in morse code. I picked it up with a simple antenna and a SDR. Time increases to the right in the image and frequency is the vertical axis. It shifts because the satellite was moving away from me during the capture. Track CUTE for your location.